Efficient heavy duty scourer pads. Powerful cleaning for tough jobs. Anti-grease system so stays cleaner for longer. Ideal for burnt on food and grease. Versatile scourer pad. 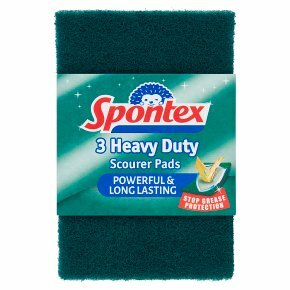 Spontex Heavy Duty Scourer Pads are efficient and strong, making them ideal for tackling burnt on food and grease plus any other tough jobs that require powerful cleaning. They are made with anti-grease technology so the scourer does not retain grease and stays cleaner and efficient for longer. Scourer pad size: 10 x 15cm. For best results, use wet with your usual washing-up liquid or cream cleaner. Rinse thoroughly before and after each use. Do not use on non-stick pans or any delicate surfaces. Test on an inconspicuous area before first use.